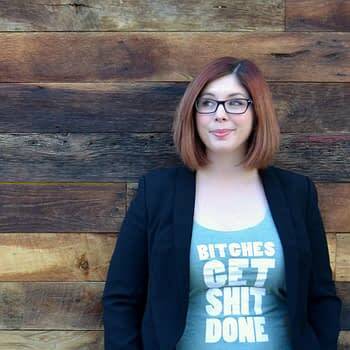 Janelle Asselin is a comic book activist and publisher of Rosy Press and the anthology Fresh Romance coming out from Oni Press. I cannot pretend to be strong enough for comics anymore. It has worn me down to the bone over the last ten years. I have done my best to make the industry a better place, and I feel like I have failed. I talked a big game, but the impact I’ve ultimately had is not what I would’ve wanted. It’s dark days in a person’s life when they wonder, instead of reporting a sexual harasser and leaving DC in disgust, if they’d stayed silent and kept working would their impact have been greater? What roads that I did not take could’ve made more of a difference in comics? Rosy Press is going to be shuttered indefinitely, with further conversations to be had with individual creative teams about what this means for their stories. I’ll do my best to make sure those stories all see the light of day, because I strongly believe in the creators I’ve worked with and I strongly believe in the work they’ve done. This is a personal decision, absolutely, but it’s also a financial one. The truth is that it’s become impossible to move forward with Rosy Press financially with digital sales where they are. I could do another Kickstarter to try to sustain a few more months at least, but my health couldn’t withstand the stress of that on top of trying to pay my personal bills with a full-time job. The print edition did great, and Oni will continue to offer it. But if what you need from me is Janelle Asselin, Comics Personality and Commentator, that person is gone. At least for the foreseeable future. I certainly have had differences with Asselin, but have valued her work in publishing and in comics activism. I believe she is placed in the upcoming Top 100 Bleeding Cool Magazine Power List, which went to press before this news. And I would support her return to the medium in any fashion in the future. It is lesser without her presence.